Holy water is the primary way Catholics encounter water as a sacramental. It is blessed on the Feast of the Epiphany (January 6) and is used throughout the year. Having a font in your home is a great way to store holy water for blessing yourself as you leave or enter your home or before going to bed. 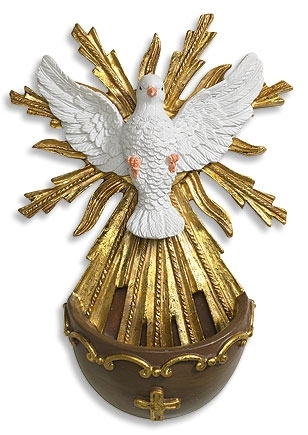 This holy water font is crafted of durable resin and features a Holy Spirit design.